If there’s ever a go-to look, it’s double denim for me. Denim has been around for ages and has proven it is here to stay. 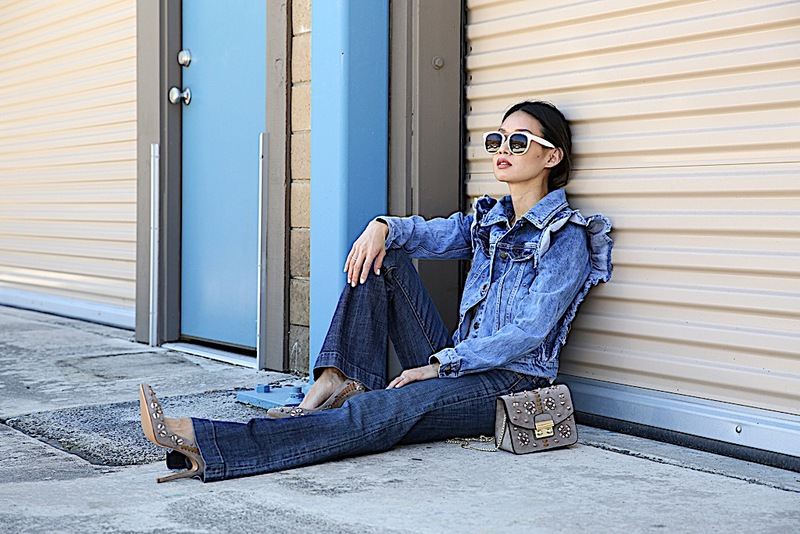 Being born and raised in southern CA, I’ve always been drawn to the casual, effortless vibe of denim. For this outfit I paired a ruffled denim jacket from Zara with some denim flares. Since this ruffled denim purchase, I’ve seen the trend popping up everywhere and included some links below to other amazing denim jackets. I love the feminine details of this jacket to offset the overall rugged denim look. With warm weather upon us, white sunglasses are the perfect statement and transition piece to take this look into summer. And where would my matchy matchy outfit be without bag and shoes that also match? This beautifully detailed bag has been my go-to mini bag right now. I love the soft, taupe suede color of the bag with the bronzed, embroidered details. The same pattern is on these incredible pair of pumps and while I wouldn’t normally wear the same print on bag and shoes, there’s enough denim to break up this twinning combination. The best thing about wearing double denim is that you probably already have everything you need in your closet right now. Stick to classic styles and clean washes like skinny jeans and a chambray top or relaxed, straight leg jeans with a cropped denim jacket. If you are still a little hesitant to wear an entire look of the same denim wash, you can mix washes too such as white and blue denim together like I did here. No matter how you wear it though, double denim will always look cool, confident, and chic. You are so sweet Mariann! I am petite too and I actually have found that flared pants make your legs look even longer because you can hide sky high heels or platforms under the flared pants. You should definitely give them a try! I am loving this entire outfit. The flared jeans are way too cool and I love all the jeweled details on your shoes and your bag! Very beautiful as always. Thanks for sharing my dear. Thanks Kate! 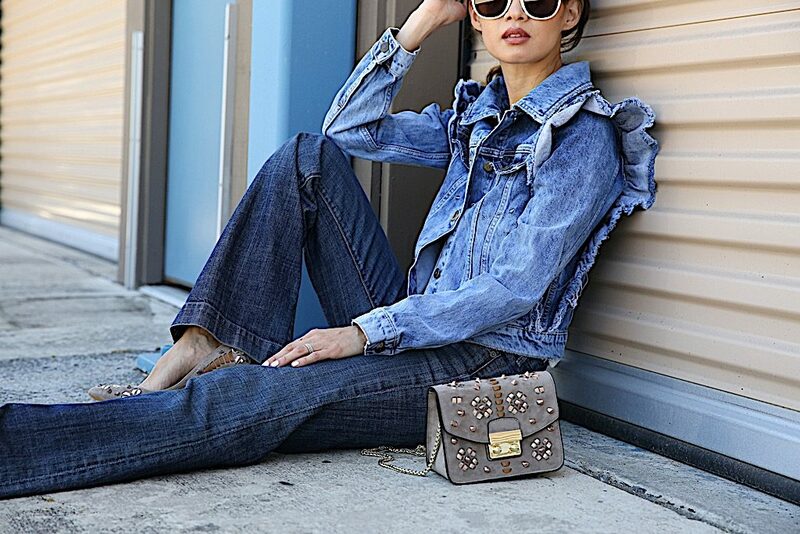 I love the vibe of flared jeans and since the double denim is pretty basic, the embellished heels and bag add a subtle pop. I honestly struggle with rocking double denim, but this is perfection! You are always confident, cool, and chic. Love this timeless take on double denim!! Thanks Amy! I think denim of any sort always makes anyone look chic! 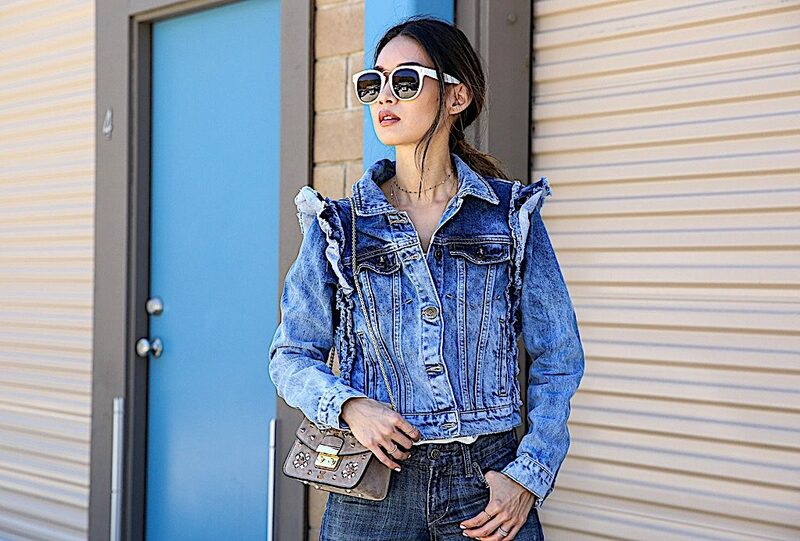 loving your take on the double denim trend, Christine! That ruffled jacket is the coolest statement piece and I agree the white sunnies ooze summer vibes, Perfection! 🙂 Hope you are having a great week so far! Thank you Saida. I love denim jackets but this one is unique due to the ruffles. Zara has the coolest pieces, but luckily I’ve found other brands too that started the ruffled denim jacket trend. Ok!!!!! First of all you look amezzzzz….. head to toe perfection, babe. I’m literally in love with your jeans. Denim on denim is one of m fave combos ever!! And your bag is too cute. Awww, thanks Raysa! Denim and denim is just so easy right and always looks chic. I love your Jean jacket. I could wear it every day. Everyone needs a go to Jean jacket like the LBD. In love with your bag too. Great look. This is one denim on denim look I’ve never tried, lighter denim with darker denim. I must say, you nailed it though! Another thing I love about this are those coordinating accessories. Taupe was the perfect neutral choice with this look! Thank you Samantha! I love your little pun and appreciate that you noticed the balance between the ruffles and the wide legs. Thank you Adela! I am glad you share this as a favorite trend of yours with me! I know, when I saw the ruffles and I knew I had to have this unique jacket. Denim on denim is just one of those classic looks that I can’t stop wearing! Thank you Camille! I appreciate you stopping by! Aww thanks Ashleigh! I hope you ended up getting the similar jacket! It is too good to pass up and just adds that unique feature of ruffles to it. You and I both are obsessed with mini bags and I love this one for summer especially since it’s such a beautiful color. Hi Dolna, thank you so much. The shoes and bag are fun, aren’t they? I love that not only did you double up on the denim, but the bag and shoes match as well – yet somehow you get away with it and it doesn’t look tacky in the slightest. Goals, girlfriend! I love your chic style! Haha, I thought it would be tacky to wear the same pattern on my shoes and bag, but somehow the double denim is enough to break up the look and pull it off! Hi Liz, thank you so much! I hope you have a great weekend! Thank you Sharon! The ruffles are what attracted me to this jacket and I love that it’s so unique. I hope you have an amazing weekend too! Omg, I got the same one too from Who What Wear collection! You can’t ever have enough denim jackets in my opinion! Ok this look is everything, I’m such a big fan of double denim and I wears them all the time. You look amazing. Hi Deddeh, thank you so much! I love that you wear double denim all the time too! This ruffled denim jacket is from Zara? Wow it’s so pretty! I love this denim on denim look Christine! Denim suits so well!!! I should be the spokes women for denim labels =P Looking forward to more inspirations from you! Hi Christine, I love your double denim look. That jacket is a dream! So gorgeous. That denim jacket is so chic, I love the way you styled it with those pumps and bag. I’m not a huge fan of the all-denim look, but the one you’ve created is so preppy and casual. One can wear it every day and still looks very chic. Somehow it reminds me about the 80s, all those denim pieces are so retro. Love it! Wow I looove the matching pumps and bag! So cute! Considering how much I love flared pants, this look is perfection.So great on you.I also just generally love your pictures.Such a great post as usual. 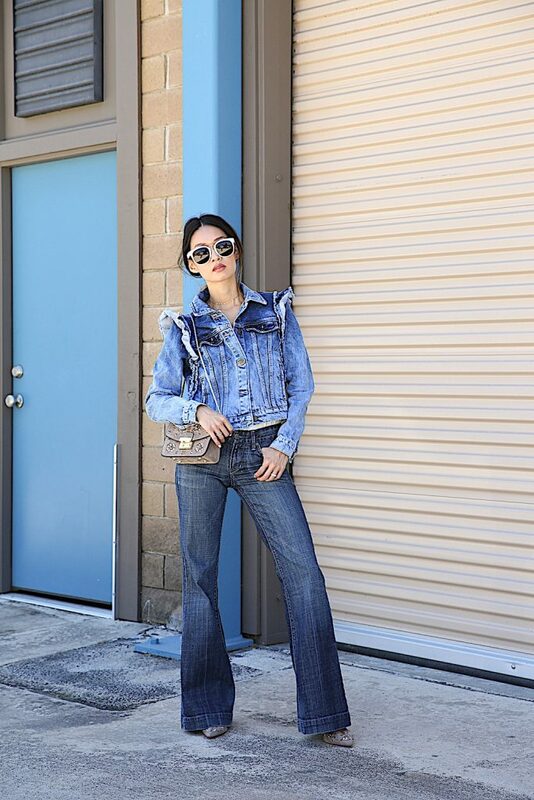 I love how you paired your double denim pieces together Christine! The silhouette from top to bottom is well balanced, so fresh and chic! Love the double denim look! It’s certainly earned it’s spot as a timeless and effortlessly cool look in my book. You look gorgeous! I love your chic and edgy vibes in this outfit. I love your take on double denim which can be quite hard to pull off but you slayed it with ease. I think the way you balanced the feminine ruffles on the jacket with the pretty matching shoes and bag really offset what can be a masculine look.The heels really elongated your legs also adding a classy touch to the look. I also love Zara ! They have so Many amazing pieces at great price points. The white sunglasses added a pop of edgyness to the overall look and I really liked your denim jean picks esp the ripped ones from Revolve. OMG I love this ruffle denim jacket!!! I love how you styled denim on denim!! Omg girl the canadian tuxedo as some may call it haha! All loving how you matched this outfit, the subtle colour difference between your jacket and bottom really makes all the difference. Personally I haven’t worn a pair of long pants jeans in almost 2 years, but it’s simply because I find it too uncomfortable! But I bet you’re so use to it seeing how I always see you wearing denim on denim on Instagram as well haha. You totally personalized it and made it your own. I actually LOVE that jacket and the ruffled detail, very interesting piece. but then again, Zara always makes the best clothes! I’m so obsess with your style babe!! Only you can make a denim outfit look this chic!! The denim jacket is such a stunning statement piece and love the double color of denim they look very nice together specially with this cute bag. What a badass! You look so chic and rad and elegant all at the same time! And I agree, double denim for the win every single time! You nailed this look with the accessories and the photos are so beautiful. You are such a babe! Def checking out Zara this weekend! I went through so many double denim looks last season and while I love the trend, I’ve been feeling uninspired by it UNTIL now! Your ruffle denim really takes it beyond the basic denim tuxedo look! I’m so inspired by you! The matching bag and shoes is also a perfect combo for this look! I always find it crazy the things I find on Zara! I always feel like they look designer and at retail cost! Who doesn’t love that?! Also, I want your glasses! Adore them! Cuteness jacket, i have a lot jeans jackets but I miss the ruffled one. Love the shoes and the shades . Girl you are the queen of denims, I love this ruffled denim jacket from Zara (ssshhh but I think it looked better than the WWW ones) I have denim jackets, but not with ruffles and I have to admit I like it more because it adds a certain feminine touch. Was that the bag you brought to WWW? I was going to comment on how cute it is!! I’ve been wearing skinnies for so long that I forgot how cute flared jeans look! Def going to dig some out of my storage and see if I can fit in to them (they were before my preggo days…yikes). Christine, your outfits are always so casual and super chic, whatever you wear I want to but it. That denim jacket is die for! And the mix of different denim is actually quite unique, I never tried it. Zara has always cool pieces, I wish they were better quality like in Europe. I’m such a sucker for denim on denim and your denim jacket is so cute with ruffles!